November can mean football, Thanksgiving and pumpkin spice everything. But it also means writing: Nearly half a million people around the world set aside time every November to write their stories as part of National Novel Writing Month, or NaNoWriMo. This annual creative writing project aims to get people of all ages to write 50,000 words by the end of the month. Deschutes Public Library joins hundreds of libraries, book stores and community centers in November as they open their doors and host programs for writers. The library will follow the NaNoWriMo guidelines (50,000 words/200 pages) and will host weekly meetings at the East Bend Library to encourage writers to check in, cheer each other on, discuss technique and do some writing together. 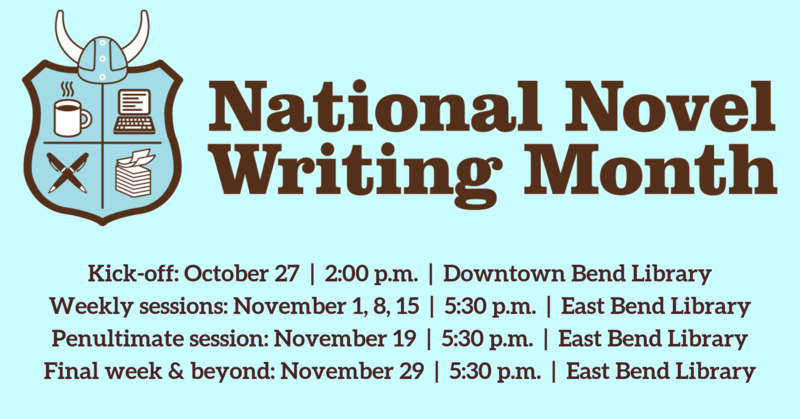 NaNoWriMo participants can check in anytime between 5:30 and 7:30 p.m. at the weekly meetups, or can stay for the full session. No registration is required. Over 250 NaNoWriMo novels have been traditionally published. They include Sara Gruen’s Water for Elephants, Erin Morgenstern’s The Night Circus, Hugh Howey’s Wool, Rainbow Rowell’s Fangirl, Jason Hough’s The Darwin Elevator, and Marissa Meyer’s Cinder. NaNoWriMo’s programs now include National Novel Writing Month in November, Camp NaNoWriMo, the Young Writers Program, Come Write In, and the “Now What?” Months. For more information about the NaNoWriMo sessions or other library programs, please visit the library website at www.deschuteslibrary.org. People with disabilities needing accommodations (alternative formats, seating or auxiliary aides) should contact Paige at 541-312-1063.